Leaves, photocollage, Acrylic, gouache and resin on wood panel 24 x 24 in. I first learned of collage/painter Fred Tomaselli while at our local library. 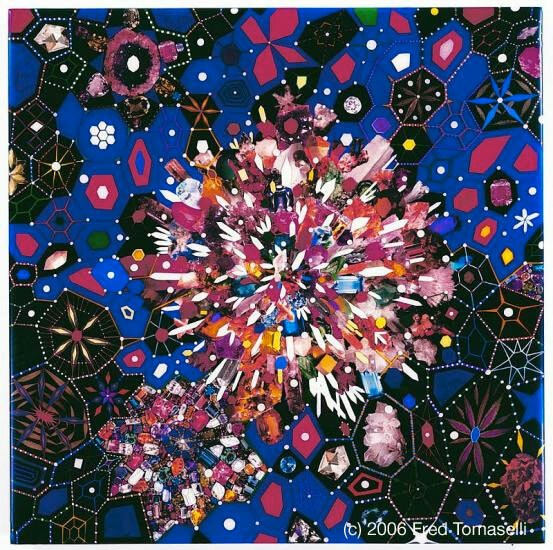 Spotting a mandala image on the cover of a large art book entitled “Fred Tomaselli” caught my eye. I checked it out and checked it out. His art is vibrant and powerful…and so different from anything I had seen before. He uses a variety of traditional art media along with conventional materials…like photos, vegetation and even pills. This piece is particularly striking. Even with all the activity going on in this painting, we still find ourselves going back to the focal point of the piece: the “explosion” (my words) of pieces making up the large mandala-like structure…the stark white pieces along side the big mix of colors, makes it pop. His art inspires me to rethink how and what I use to convey my art and my art’s message.